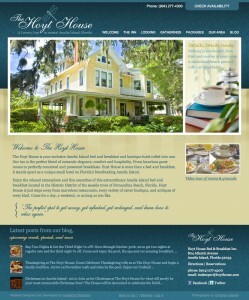 New Website and Blog for Hoyt House Bed and Breakfast Inn on Amelia Island - InsideOut Solutions, Inc.
InsideOut Solutions is pleased to announce the launch of a new website and blog for Hoyt House, an Amelia Island bed and breakfast inn in Fernandina Beach, Florida. This beautiful new website was designed and developed by InsideOut Solutions in WordPress and features the photography of Christian Gianelli. Manage their entire website with a single login. Find everything easily with the very friendly WordPress user interface. Make quality blog posts with the #1 blogging platform on the web. Easily add, modify and delete website pages, page copy, blog posts, images and photos galleries & albums. Enjoy easy Search Engine Optimization control. Access InsideOut’s stock images and custom WordPress photos, recipes & specials plug-ins. InsideOut Solutions is migrating many of our clients to the WordPress platform so that they may take advantage of the ease and flexibility of control it offers. Please contact us if you’re interested in having your website upgraded to WordPress!